From the Star Wars collection by Body Vibe. 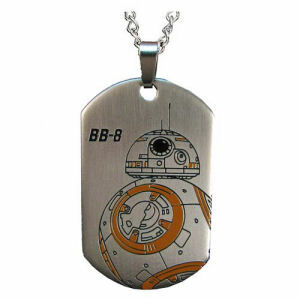 Star Wars Episode VII The Force Awakens BB-8 Droid Laser Etched Stainless Steel Dog Tag Pendant Necklace. From the Star Wars collection by Body Vibe. Star Wars Episode VII The Force Awakens BB-8 Droid Laser Etched Stainless Steel Dog Tag Pendant Necklace. The necklace is made of stainless steel. The Dog Tag measures 2 inches tall.